The LG G4 comes with Android 5.1 Lollipop out of the box with the latest iteration of Optimus UX 4.0, which was announced only recently. The G4 can run two apps simultaneously in Dual window mode. In the app switcher you'll see a button in the upper right corner on compatible apps. Touching that button opens the app on half the screen. KnockON and Knock Code are available, and they allow you to wake the phone with a simple double tap or a more complex (and more secure) tap pattern. That's great as reaching for the Power button on the back isn't always comfortable. LG takes pride in its lean software UI. Very few apps will be pre-installed, for example, in most markets you'll get just one browser, Chrome. One thing we missed though is themes - the square, pastel-colored icons are diverge from stock Android and we would have loved a way to customize the looks. As a perk, you'll get 100GB of free storage on Google Drive for two years. The LG G4 is powered by a Snapdragon 808 chipset. It has a hexa-core processor (that's six cores) - four low-power Cortex-A53 cores coupled with two fast Cortex-A57 cores. The Snapdragon 810 (LG G Flex2) and Exynos 7420 (Galaxy S6) have four A57s for a total of eight cores. LG claim they've worked closely with Qualcomm to customize the chipset and achieve higher performance than the Exynos though we don't see how that's possible. Another downgrade compared to the Snapdragon 810 is the GPU. It's Adreno 418 compared to Adreno 430 in the higher-up Snapdragon. Anyway, the phone comes with 3GB of RAM. 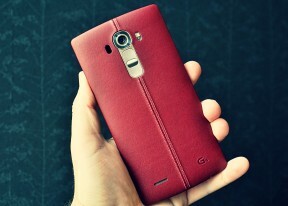 The LG G4 is the first smartphone to come out with the Snapdragon 808 chip. Qualcomm announced the 808 revision side by side with the flagship 810 model, but it is only now that we are seeing it in action for the first time. The Snapdragon 808 offers a hexa-core 64-bit processor with two Cortex-A57 and four Cortex-A53 cores, an Adreno 418 GPU and 3GB of RAM. According to LG, the chipset is supposed to provide equally good performance as the Samsung's Exynos 7420 found in the Galaxy S6 - at least for the regular daily tasks. We ran some benchmarks on the LG G4 Korean unit displayed at the event. The smartphone runs Android 5.1 Lollipop and we'd reckon the software should be pretty much final since the phone is launching in its home country tomorrow. It's obvious that the G4 is faster than the G3, but if it's the Samsung Galaxy S6 it's after, we're afraid, it has brought a knife to a gunfight. Perhaps it's best to wait until the handset is released internationally later in May before we pass any final judgements, but unless it grows two extra A57 cores in the meantime, we don't see it topping the charts anytime soon. The LG G4 comes with a brand new camera. It has a 16MP sensor (1/2.6" big) and it sits behind an f/1.8 lens that lets in 80% more light compared to the G3 camera. The lens features 3-axis optical stabilization, compared to the 2-axis OIS on the LG G3. LG has also improved the launch speed of the camera and the company claims the G4 will start its camera faster than the Galaxy S6. Double pressing the Volume down key on the back not only starts the camera but also takes a snapshot immediately. The camera software features three shooting modes - Simple, Basic and Manual. Simple is just point&shot, basic has more options and manual is the most advanced option. Manual mode displays a histogram and lets you play with the ISO setting and shutter speed to expose the image just right. There's also manual focus and white balance, plus an Auto Exposure lock toggle. You can also shoot DNG RAW files instead of JPG if you want to process them manually afterwards. LG updated other parts of the software too. The panorama in particular got a huge boost in resolution and now stitches images up to a whopping 104MP resolution. For comparison, the Galaxy S6 tops out at 60MP and the iPhone 6 - at 42MP. The camera enjoys special hardware - Color Spectrum Sensor - which LG says is the first of its kind on a smartphone and measures the ambient light to adjust white balance and the flash color. The following demo setups by LG illustrate the benefits of the Color Spectrum Sensor to achieving more accurate white balance. You can also see how the wider F/1.8 aperture affects exposure compared to some of its competitors - the Galaxy S6 and the iPhone 6 Plus. Finally, the last shot demos how the new Slow shutter mode on the G4 allows for painting with light. We managed to snap a few samples, but they aren't perfect since we couldn't leave the venue. Also here are the official camera samples taken with the LG G4 - we snatched those off an LG G4 demo unit at today's unveiling event. The selfie camera is now an 8MP shooter, a big boost over the 2MP camera of the G3. It also has a wide aperture, f/2.0, for better evening selfies. As before, you can use Gesture shot to snap a selfie hands-free - you just raise your hand (palm open) and form a fist to trigger the camera. The LG G4 records 2160p video with the main 16MP camera but for now, we don't have a video sample to show you.